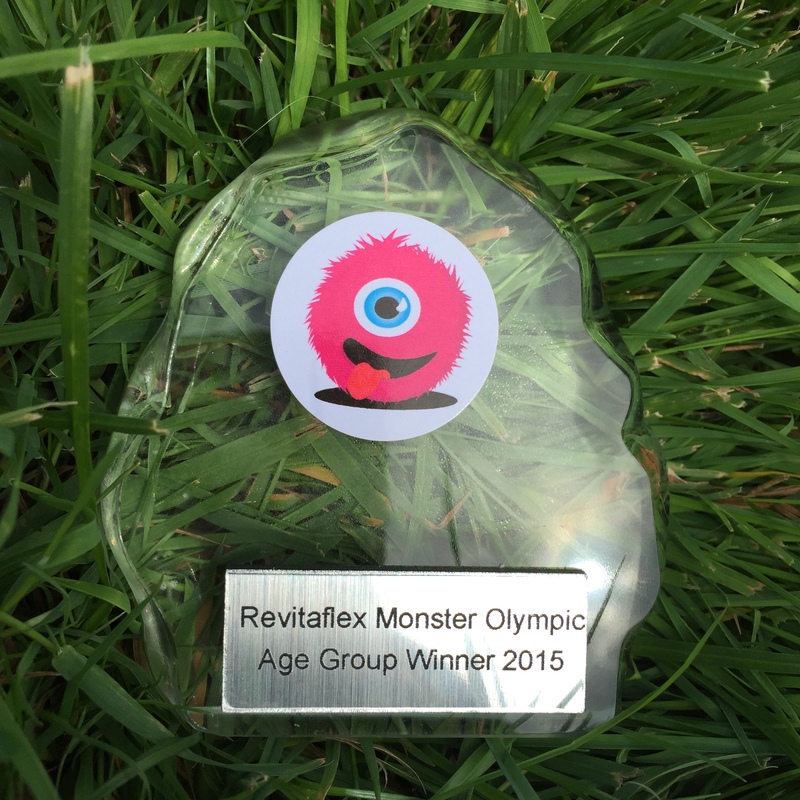 On Sunday I was the surprised winner of my first Age Group trophy, I won the old ladies 45-54 age group at Monster Olympic triathlon. My first AG win in triathlon or anything ! In some ways its amazing that I made it to the race itself. I was initially entered in to the Middle distance event, however the week before Miss Calamity appeared and I managed to injury myself not once but twice. Then I was stopped in my tracks driving there. Firstly a gash the top of my foot from walking into a collapsed windbreak on Bournemouth beach after I’d swum the Pier to Pier. Then I got lost on a bike ride and ended up heading down a bridle path that went from tarmac to an over grown hard packed mud track. 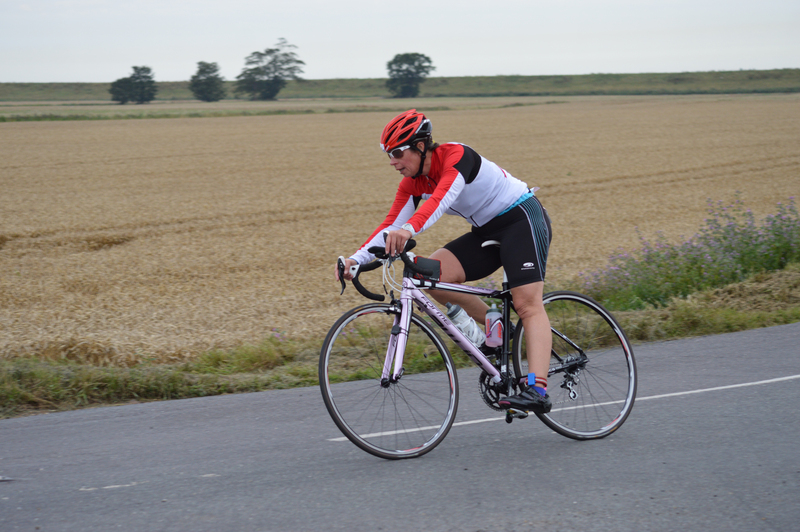 I carried my road bike for a while but not easy in cleats up hills and through nettles. So I hopped back on and seemed to sprain my wrist from the shaking, bumping and wrestling my bike back 2 miles out onto a proper road. The route would have been better suited for a mountain bike not my lovely road bike, I promised it a full clean, check over and lube later. 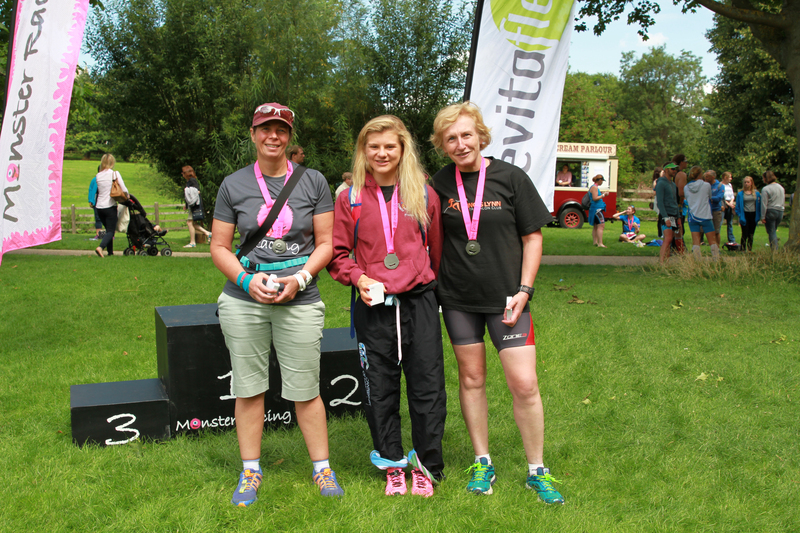 Putting my sensible head on I contacted the organisers and asked if I could change from Middle to Olympic distance, mainly due to my sprained wrist, it was a long shot as both events had sold out. But my luck was in there had been a withdrawal that morning. 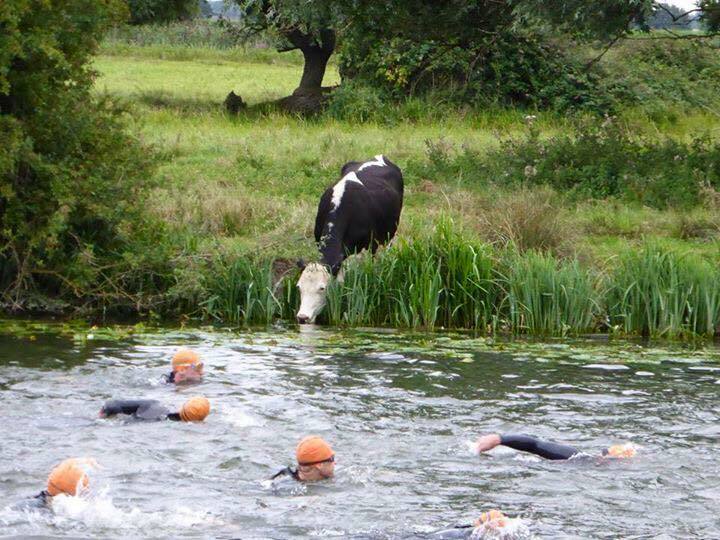 Feeling better that I only had 28 miles of riding not 56 I was looking forward to heading to Ely, Cambridgeshire for this river swim triathlon in a new location for me. I had a new roll of kinesiology tape for my sprained wrist, a box of waterproof plasters for my foot what could go wrong now ? Well a 3 car shunt on the drive there! I was stationary waiting to get over a roundabout when I felt not one but two impacts to the back of my car. Checking the other drivers were OK, we all exchanged details, they called for tow trucks as their radiators leaked away its life waters & and a witness from the adjacent cherry fruit stand appeared. I then went to check my bike which was inside. I slowly pulled my car away from the blue car which had tried to mount mine. Gingerly I went to open the boot hoping if I did it would then close again – all OK.
Triathletes and cyclists will already have worked out I was wanting to check my bike was OK and that I could continue to the event. Quick assessment I’m OK, bike OK, car was drivable and could be fixed – phew, now lets get to the event. Registration, a meal outside by the river and then set up camp on a rugby pitch alongside a railway station, which I hoped that the trains wouldn’t run too late into the night. 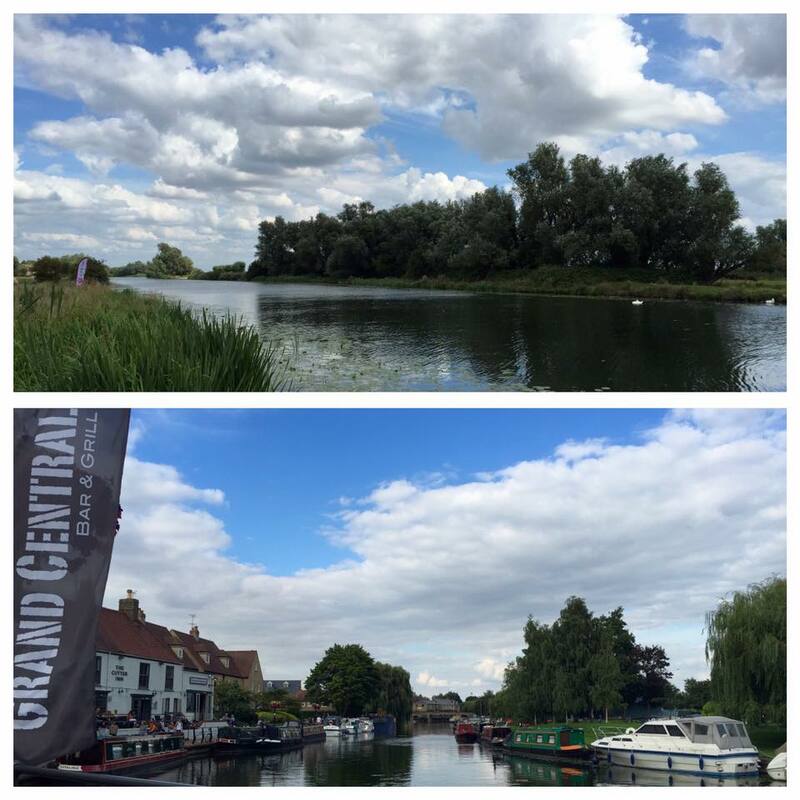 Ely is a lovely setting, the cathedral in the centre surrounded by the lowlands and the river running through. Saw old windmills, plenty of wildlife and an active river community. 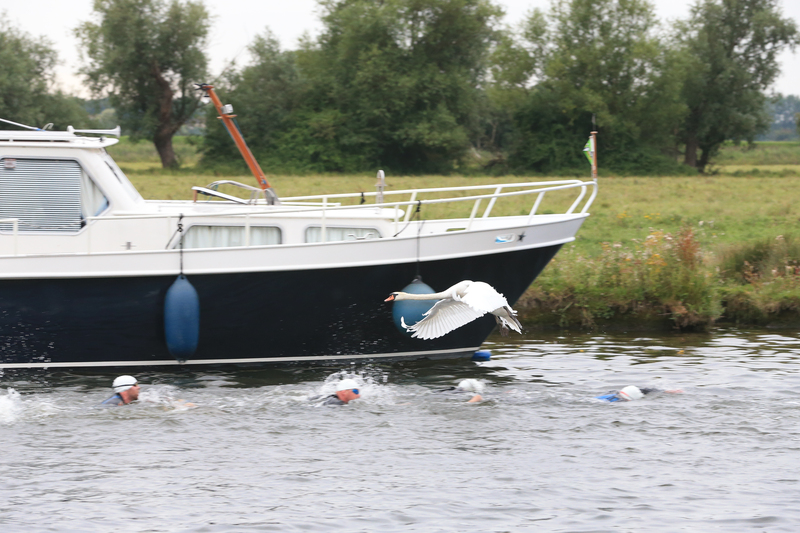 Swim – river swim was two thirds upstream and quite narrow in places with weeds and boats lining the riverbanks, swans leading us out then flying back overhead, drinking cows lining the riverbank and a couple of swimming dogs. Lots of spectators cheering from river bank & boats. The water was a reported 19c, looked clear with a steady flow. Quite a lot of bumping and barging up until the turn around point, even though we were split into 3 waves. In a boat ahead of us on the river the mayor started each wave. Not much sighting needed as we were in a narrow swim corridor and the river not too wide, we passed under a couple of bridges where you could feel the current, as we came into the town the river banks were packed with more clapping cheering spectators. Around the final buoy and up a carpeted slipway with many ‘grabbers’ to help you back onto your feet. There was a minute and half or so run from river exit to T2, later we were provided with pure swim time, 28minutes, plus a swim exit run & T1 times given. This was good so you could compare swim and T1 times with other events. I faffed a bit too much in T1 adding a thin long sleeve jersey, put a new plaster on my foot and dry socks. I was thinking comfort not speed. 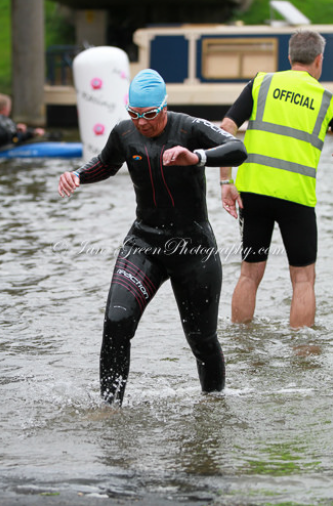 T2 was a bit quicker as I took off jacket, put on new socks & plaster but no wetsuit to wrestle with. The wind was a bit of a bugger on the bike as the roads were long and flat with no natural or manmade windbreaks. But the rough road surface was worse part, one section particularly bad was like riding on corrugated sheet and brought back bridle path memories from last week ! I rode one handed for a few miles even though I’d added extra bar tape for cushioning, not very aero. 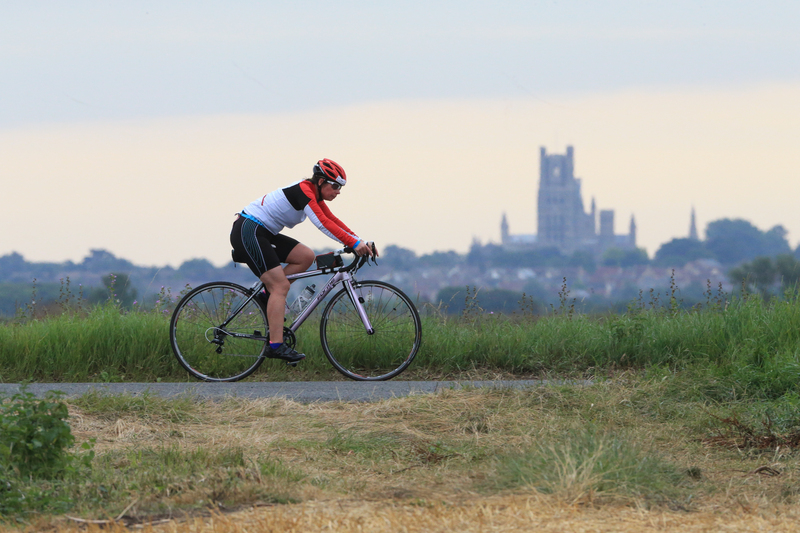 It was great seeing Ely cathedral which we rode around for most of the ride as that was our return point after 28 miles. I had been warned by a few previous competitors about the hills, well I didn’t find the hills on the run just a couple of inclines! Trail running in Wiltshire must help. Getting from T2 to the start of the laps was a bit of a mix of river bank, park, through houses. The town loop though allowed us to run through and around the cathedral groups and the town centre. Again lots of spectator support and curious tourists. It was a good loop with no pinch points. I was glad to see the finish as it was now 24 hours since my car accident and whiplash was starting to stir. Maybe the swim and bike also contributed but my neck was getting tender. Unusually I don’t look too happy in my finish line photos, but soon perked up when I got a bag of my favourite salt & vinegar crisps, water and a banana. I headed to the results booth, typed in my number to see I was 8th Overall female and confirmed I completed in 3 hours 2 minutes. I don’t wear a Garmin for races just my trusty old TIMEX digital watch. Another lady next to me was congratulating me and said I was probably good in my age group ?? Not knowing what others had done I had no way of knowing. Still hungry, but stupidly I’d left my money back at the car so I went to collect my bike & kit and took it back to the car, quick change and then back to the finish area for food where the presentations were due to start shortly. I went up to collect the trophy along side two other ladies and we got our picture taken. If I’d known I would have made the effort to brush my hair, dress up and practise an acceptance speech ! Instead I was in shorts, still had on my running shoes, bright blue kinesiology tape on my wrist but at least had my finishers t-shirt and medal. The little iceburg trophy is cool and sitting on my window ledge at home in pride of place amongst the dust and disorganisation that is currently our cottage due to building works. So for a race that nearly didn’t happen I was very chuffed to come away with a Monster trophy, t-shirt, medal, buff, gym bag and arm warmers. 48 hours later the whiplash has all but come and gone a bit like DOMS. My legs still feel tired but my wrist has also eased. The car is booked into the repair shop and the insurance company have waived excess, I won’t lose any no claims as a No Fault to me accident. Tough nuts these VW Golfs. Great result Zoe! Always nice to get a reward for your hard work. Great stuff Zoe! Always nice to get a reward for all your hard work. Great result Zoe! 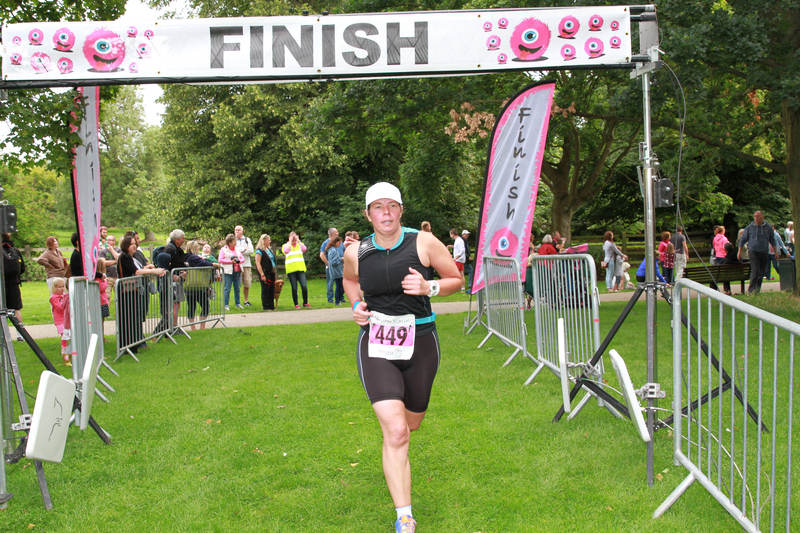 And great race photos!! Wish I was as photogenic in my race pics!! Thank you 😃 Apart from my finishers pic ! Congrats on first place and for getting insurance company to waive excess, both great achievements! 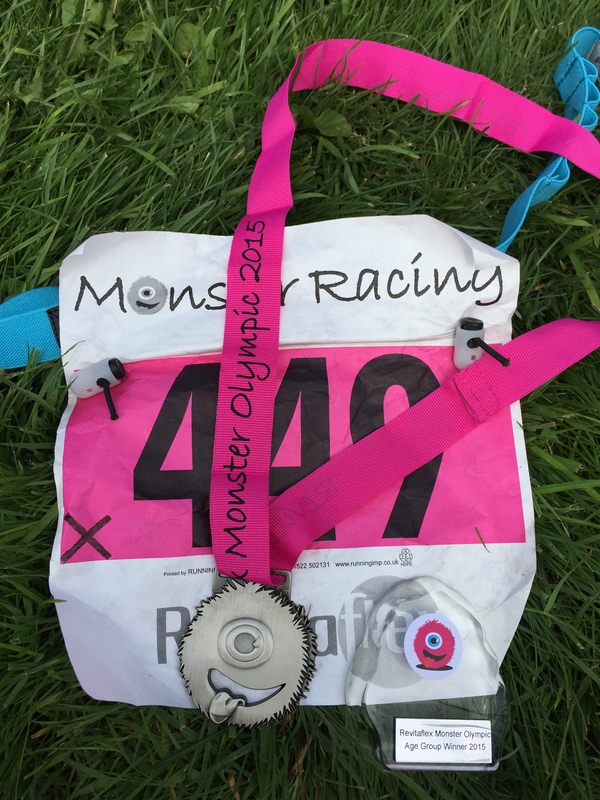 I’m thinking about doing one of the Monster Racing series events next year as I love those medals. You did great, despite not having the best start to the day!